« To Spawn or Not To Spawn? This season, though the weather hasn’t always been warm and inviting, the FC and I have enjoyed many picnic celebrations, including two picnics on the same night. 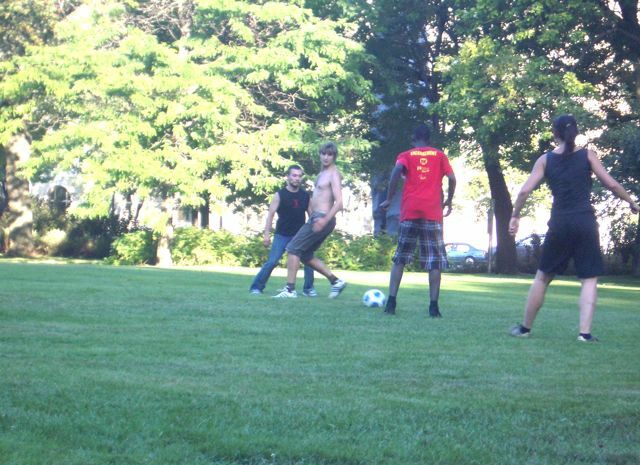 This kind of predicament could only happen in Montreal. It’s just a picnic kind of town. This past weekend was no exception. My fellow foodie friend Anton and his girlfriend Yoojung live right across from Parc Jeanne Mance and their big purchase this summer was a portable gas bbq. What a great idea! This means you can have a bbq in the park and invite as many people as you want (no more cramming on your teeny terrace.) Friday night Anton slapped some fresh burgers on the grill. Instead of making his own, Anton picked up some paddies from Mister Steer (appparently they sell them raw as well as cooked) and, I have to say, their reputation as Montreal’s best burger joint is earned. Yoojung made a spunky beet green salad with sesame vinaigrette. For dessert, I decided to finally use up the basket of peaches I bought for $2.50 at my local Metro and make a peach crumble (see, I Crumble For You, Peach Crumble). But I wish I’d doubled the recipe. Picnics usually draw a few drop-by guests, so my crumble for six ended up having to feed nine. But that’s okay. Picnics can’t always be planned. Often the best picnics are casual and last minute. 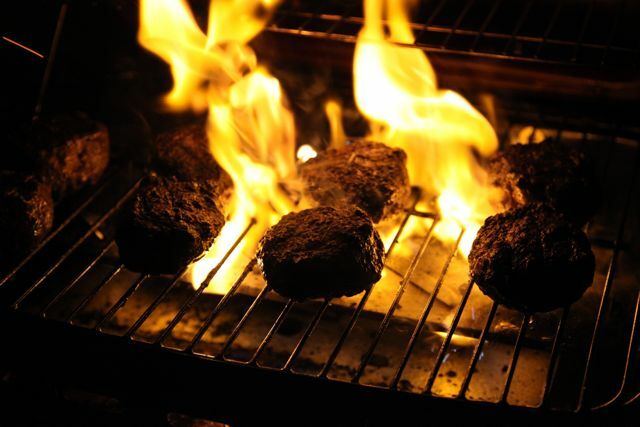 Anton's burgers from Mister Steer sizzle on the grill. 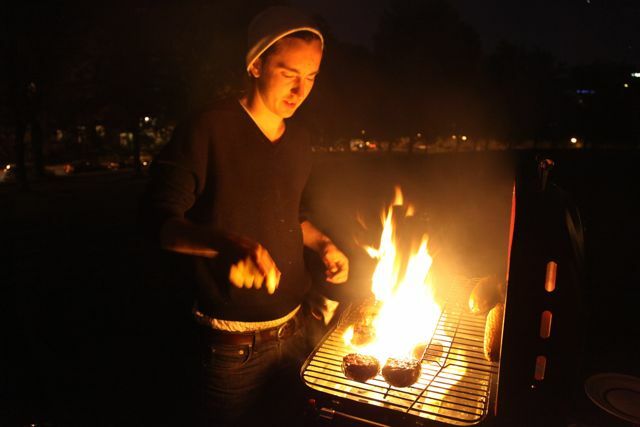 With his portable bbq, Anton makes parc Jeanne Mance his very own outdoor kitchen and dining room. 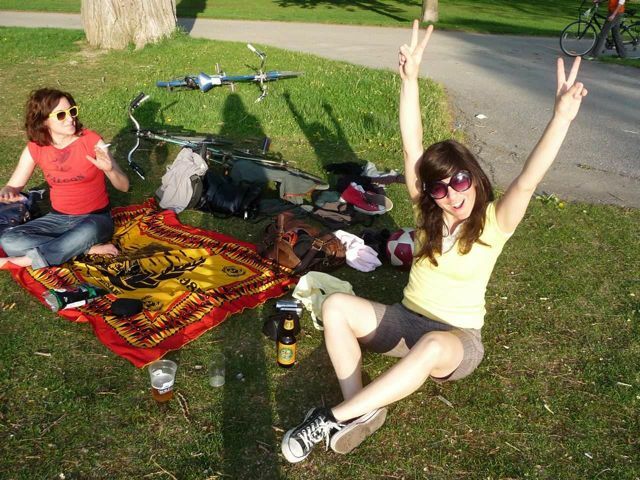 We were so happy picnicking in the park on Friday then we decided to do it again on Saturday afternoon. No food this time, just a group of us hanging out in the park with a six pack of beer. The FC joined a nearby soccer game, our friend Fausto strummed on his guitar, and Gigi, Daniel (co-owner of the wine bar Kashkaval in NYC) and I chatted about real estate, then realized we were enjoying some pretty amazing “public” real estate. (In that sense, every Montrealer is a rich landowner.) All in all, it was a relaxed Saturday afternoon, and poignant too, since we all know these are the last days of summer and another minus twenty winter is just around the corner. 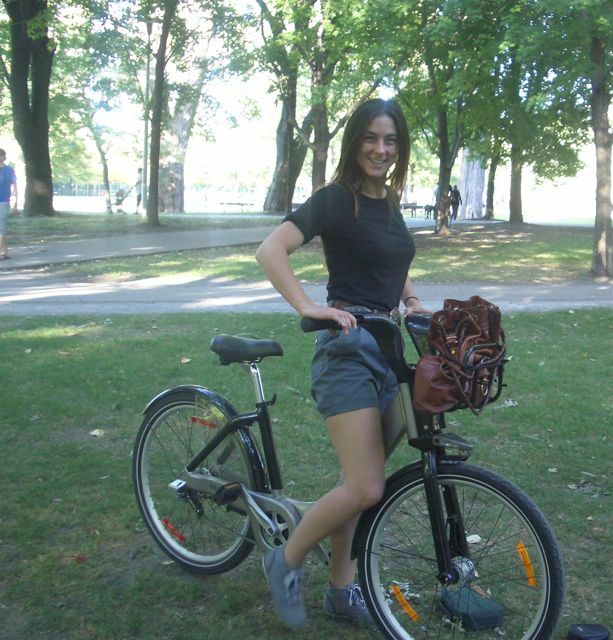 Rina (who works as a product developer at Fullum & Holt) drops in on our picnic riding her Bixi bike. 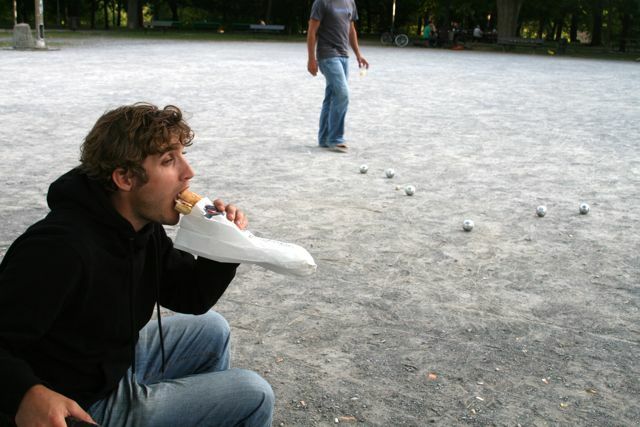 I’m almost embarrassed to admit it, but we were so utterly picnic crazy this weekend that the FC and I picnicked again on Sunday, bringing baguette sandwiches to Park La Fontaine and playing a round of petanque (my new favourite game) with Gigi and Fausto. 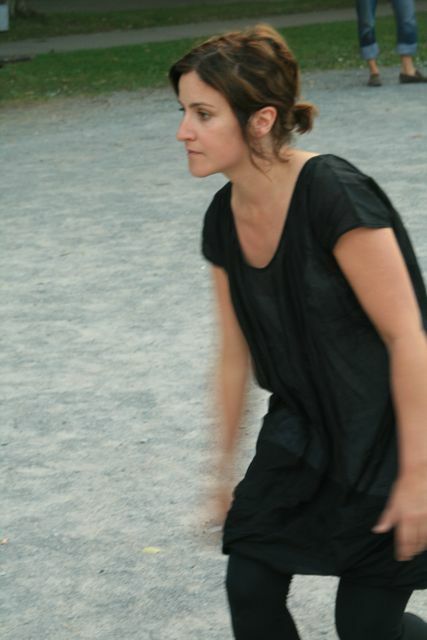 Though the air started to chill, the picnic and petanque kept us warm. The FC was so happy he drew a heart instead of a circle to mark that spot to throw from. Isn’t that sweet? Who knows– we may even have another picnic tonight?! 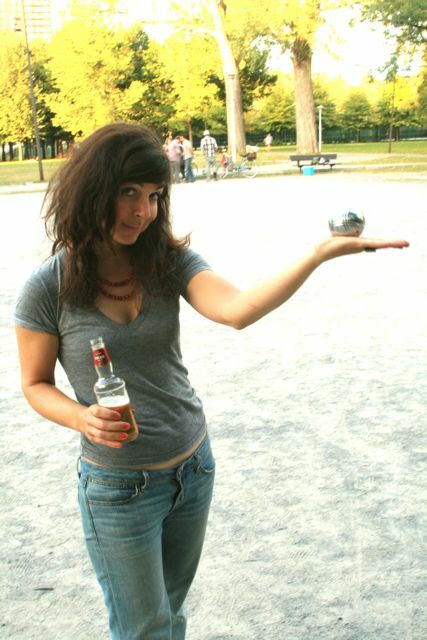 Isn't the silver petanque ball pretty? I bought the FC a set of "Boules" for his birthday. It's a great gift idea for your favourite rooster. Fausto takes a shot. 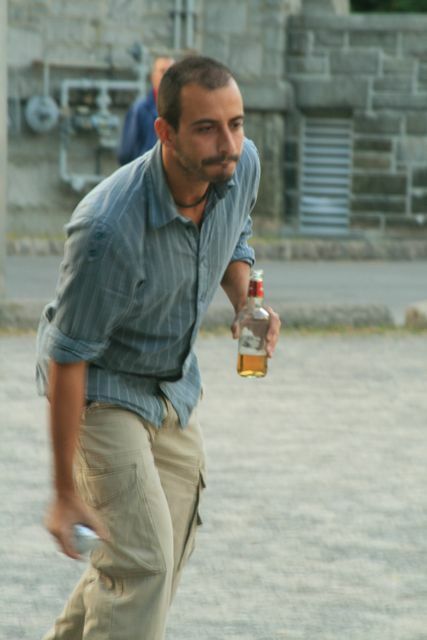 Petanque's one of the few sports you can play and drink beer at the same time! Gigi's turn to toss. She's a sharp shooter. This entry was posted on Monday, September 14th, 2009 at 4:35 pm	and is filed under Uncategorized. You can follow any responses to this entry through the RSS 2.0 feed. You can skip to the end and leave a response. Pinging is currently not allowed.